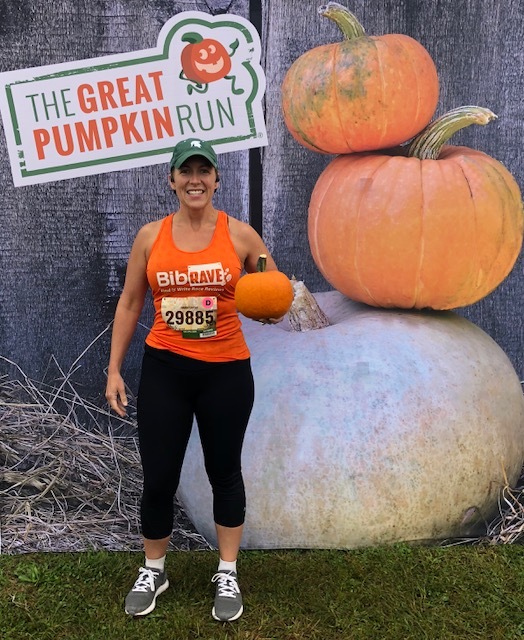 Disclaimer: I received a free entry to The Great Pumpkin Run (Lansing) as part of being a BibRave Pro. Learn more about becoming a BibRave Pro (ambassador), and check out BibRave.com to review, find and write race reviews. 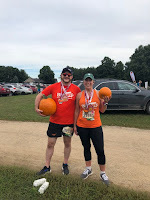 It was an absolutely beautiful and cool fall morning, on September 8, 2018, when I ran the Great Pumpkin 5K at Uncle John's Cider Mill in St. John's, Michigan. The cider mill offered a nice cross country style route over grassy areas through apple orchards, cornfields, pumpkin patches, woods and across the finish line. 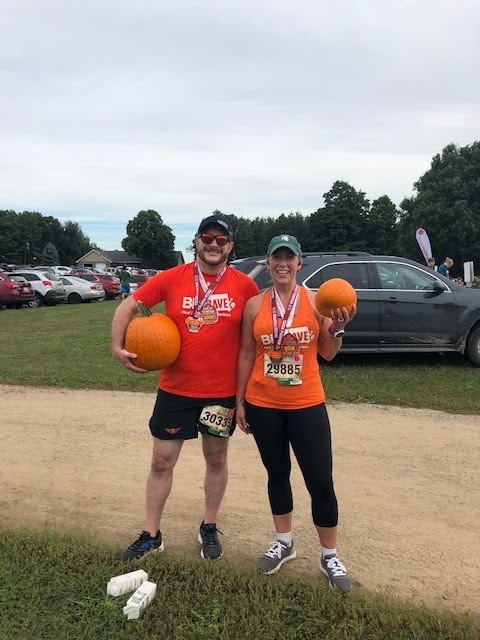 As a result of peer pressure, I decide that I would join my fellow BibRave Pros and run the Tough Pumpkin, which was the Great Pumpkin 5K with the additional challenge of carrying a pumpkin, during the run. Online registration was smooth (www.runsignup.com) and packet pick up was a breeze, because I arrived the suggested two hours before the start. 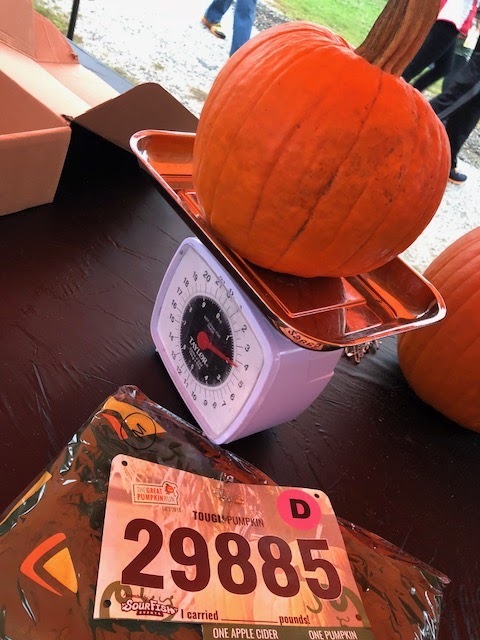 The race email indicated that lines would get long an hour before the race so participants were encouraged to get to the location early to obtain their bib, race packet and pumpkin (if applicable). I am glad I followed this warning as I did notice that the registration tent did get a little congested, closer to the race. Tough Pumpkin participants had the choice between a small, medium or large pumpkin to carry while running the beautiful 5K course. 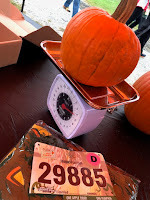 I carefully chose a "small" pumpkin, it was weighed and I was on my way to the start line. One would not think a little 4.5lbs pumpkin would be too bad to carry for 30 minutes (generally, what it takes me to run a 5K), but I struggle carrying my phone for a mile so I knew I had a challenge ahead of me! I wore my FlipBelt Crops, which allowed me to stash my phone in my front and secure my keys with the inside clasp, while I carried the pumpkin. I tried to switch arms, but I carried the pumpkin in my dominant, right hand. The next day, my bicep was screaming at me! 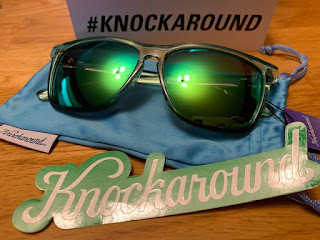 The completion lightweight tech hoodie that runners received with their bib will serve as a great addition to my fall wardrobe and a fun conversation starter. The Tough Pumpkin 5K is probably the closest to an obstacle race I will ever run and I had a blast! 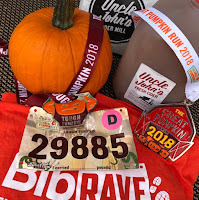 The environment was so supportive and friendly and once I completed the race, I ran up to the mill to purchase a gallon of cider and 1/2 a dozen donuts to take home! This is a must do race to start fall racing season!